I have a new favorite website for researching food ingredients, www.foodfacts.com. It’s great when you want to know what is in some of your favorite foods without heading to the grocery store and reading the labels. They also have a heading system highlighting known allergens and ingredients that are controversial or known to be unhealthy. As usual, a bunch of unpronounceable and unrecognizable ingredients! Prepare hot dogs according to package instructions and chop each hot dog into six pieces. 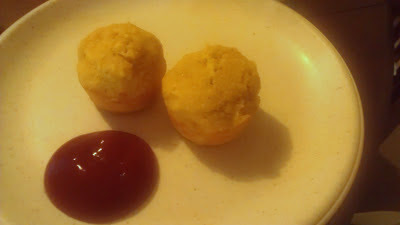 Spoon a small amount of mixture into each muffin cup. Add a hot dog into each muffin cup. 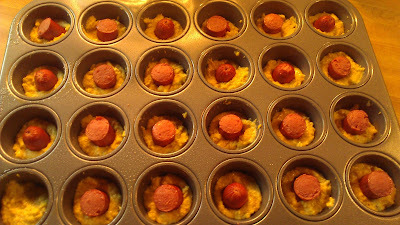 Distribute remaining mixture among muffin cups, covering each hot dog piece.